Quick Summary: Recently I had the opportunity to try Excel Everest, an excel spreadsheet that teaches you how to use excel. In this post I tell you why it is a great product to learn excel. Plus, you can get it for 20% off if you use the discount code chandoo. What if we can make an excel workbook that can teach us excel? Wouldn’t that be cool..? It was a question that motivated Sean Duffy, a former Google employee and his friends to design Excel Everest – an excel spreadsheet built to teach you, … wait for it … , Excel. Sean wrote to me a few weeks back and invited me to test his beautiful product. I have played with Excel Everest and I found it to be quite an interesting tool to learn Excel, so much that I wanted to share with you about this. Excel Everest is an excel workbook designed to teach you excel. It has 41 topics and has 155 exercises, 339 buttons, and 87 embedded videos. It is a text book, problem set, video library all rolled nicely in to one excel file. It teaches you various excel topics, one at a time and gives you some problems to work on. Once you finish the problems, Excel Everest even grades you automatically. Pretty cool, eh? 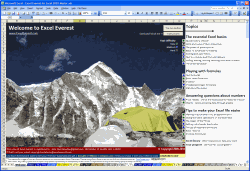 Who is this for and What can you learn from Excel Everest? Charts & Pivot Tables: Understanding numbers and answering questions. Each topic is explained in a separate worksheet with text, images, videos (youtube videos embedded in excel) and various examples. Excel Everest is priced at $34.95. But here is the good news. When I told Sean that I would love to write a review of his product, he was kind enough to give readers of Chandoo.org a discount of 20%. So, you will actually pay just $28 for this when you use the discount code “chandoo“. What is my opinion about Excel Everest? How the file is structured and how each topic is flagged as easy / medium or hard (see below). Exercises and automated grading. There are questions / short quizzes after each topic and as soon as you enter you will graded. That said, this is not the product if you are already familiar with various excel features and use them decently. For the rest of you, this can be an extremely fun way to learn excel all the while using it. I recommend getting a copy of Excel Everest if you are new to Excel or need a thorough introduction to various features in Excel. Make sure you use the discount code chandoo to get 20% off the final price. Do you have any questions about Excel Everest? I have been using Excel Everest for last few weeks, so I kind of know what it does best and how it works. If you have any questions about it, ask them thru comments. I can answer them. Disclosure: I receive small commission whenever you buy a copy of Excel Everest with discount code “chandoo“. But I am sure you will derive more benefit out of this than Sean or I will make out of the sale. Click here to get a copy of Excel Everest. My name is Chandoo. Thanks for dropping by. My mission is to make you awesome in Excel & your work. I live in Wellington, New Zealand. When I am not F9ing my formulas, I cycle, cook or play lego with my kids. Know more about me. I hope you enjoyed this article. Visit Excel for Beginner or Advanced Excel pages to learn more or join my online video class to master Excel. Thank you and see you around. Great Post Chanddo as usual. I bookmarked it and purchased a copy. Hi all, it's Sean from Excel Everest. Thrilled to receive such a positive review and let me know if you've got any questions (support@exceleverest.com). I see that this tool is only available for Window PC's at this time. My daughter would love this product but she has a Mac. Could she purchase it and keep it on a thumb drive or flash drive and practice it when she has access to a PC by loading it from her travel drive or thumb drive or ( various names )? Please advise and thanks! @Pat... Thanks. I am happy you liked it. Do tell us what you think about the product once you used it. I am sure our readers will enjoy your views. @JT: I think your daughter can safely use the file in other windows PCs by loading the file from thumbdrive. She can save the file back to the drive so that her progress, scores are preserved and will be loaded next time she opens the file. The file is licensed to your daughter, not to a computer. @JT: She can indeed purchase it and use it / save her progress on a thumb drive. Also, Excel 2011 for Mac will have VBA support so we *should* (fingers crossed) be able to make a Mac version soon enough. Let me know if you've got any more questions! @Vijay... Thanks for your comments. I am sorry to know that you are getting errors while trying to get a copy. But unfortunately I cannot offer this product from my site. Sean is the owner of it and I am just recommending it as I found it to be a valuable resource for our members here. I suggest that you write to Sean (can get it his email id from exceleverest.com ) and see if he can help you. @Vijay... what sort of errors are you getting? I'm sorry about that. I just checked our purchasing systems and everything seems to be running smoothly. What browser were you using? Maybe try from Chrome or Firefox? Feel free to email me directly at seanduffy -- at --- exceleverest.com and we'll figure this out. I have downloaded the trial copy and it looks engaging. I like to gift it to someone who do not have an internet access. Do you have any version that packs all the videos (like Chandoo did for his excel tutorial downloads)? I purchased Excel Everest yesterday and am having trouble with the download. It downloaded from my email with no problems - but when I open it I get errors. This one pops up 24 times: "File error: data may have been lost". It then shuts down. I've tried downloading a few times on different computers and get the same error. Please advise! I am very anxious to try the software. Thank you! Hmm... that's an odd error that I don't think we've seen before. Why don't you email us at support@exceleverest.com and we'll figure out what's going on. I need a little more information from you! You should probably take down this post and/or the discount code - it doesn't work. I have been trying to get a hold of the company, but no none answers my emails. Is there a phone number? At Chandoo.org, I have one goal, "to make you awesome in excel and charting". This blog is started in 2007 and today has 1,000+ articles and tutorials on using excel, making better charts and workbooks. Read more.